Well Twilight Time stumped me yet again. I had never seen this film before, and in reality it's one of those films that passed me up. I never even knew it existed until reading the release news of Twilight Time’s September Blu-ray’s. Shocking I know, specially considering who stars in it. I always love going into films with a blank slate. Not knowing what a film is about or details of a film is always grand, and that is what happened here. I am kind of ashamed of myself not knowing anything about it. Surprisingly ashamed, in the regards of not knowing anything about it, and how really great a piece of cinema that it is. Twilight Time simply introduced me to this wonderful piece of forgotten cinema. Also amazing in not knowing anything about it, is the director behind it. The amazing actor, director, and all around film guru, the one of a kind, John Houston. Houston had many hits, and also some misses in his acting, and film making world. You cannot deny his ability to craft, and create stunning pieces of cinema. I mean look at his first film he directed, the amazing, The Maltese Falcon, that should sum up his genius. Then you can look at the amazing, extraordinary movie experience of 1948’s The Treasure of the Sierra Madre. That would garner him many nominations, and also the win for Best Director, and adapted screenplay at the Academy Awards. Houston had a brilliance about him that was all Hollywood, or film in general. He not only, wrote, directed and acted, but he became the very picture he was making. His films had a living quality to them, that very few directors can capture. Houston owned his films, and Fat City is no different. Fat City is not in the same category as some of his masterpieces, but it still is one of those pictures that beg to be seen, and experienced. I suppose the reality of how important this film is, is in the eyes of the beholder, because it is a true, memorable experience in story and acting. I think this film goes up there with his greats. A wonderful cast. The great Stacy Keach as an aging alcoholic boxer, named Billy Tully. His goal is to get back in the game of boxing, or his name back out of the washed up reality. Insert the young boxer, Ernie, wanting to make a huge name for himself, played by the wonderful, personal favorite actor of mine, Jeff Bridges. Bridges is so young in this film. Now Billy spars with Ernie. Billy thinks Ernie is a great young upcoming boxer. Billy gives Ernie the number of his old manager. This reality sparks the interest of Billy to get back in shape, and further his name. The backstory is Billy’s wife left him, and now he drinks too much, and can’t hold a job, basically down in his luck, depressed. He holds a grudge against his old manager, in that he believes his old manager didn’t correctly work out his last fight. Also insert the female character, Oma, and love interest to Keaches character, played by the phenomenal Susan Tyrell. Tyrell is truly an actress that knew how to hold, own, and display a character on screen in flawless ways. She was nominated for Best Supporting Actress by the Academy Awards for this part of Oma. I personally feel, she never got the stardom she deserved. John Water’s fans, or cult status film fans, will know her as, Ramona Rickettes in 1990’s Cry Baby. She also graced many other examples of Cult, Drive-in style films that have a fan base all their own, such examples as, 1980’s The Forbidden Zone, Night Warning, From a Whisper to a Grave, Big Top Pee-Wee, and many others. Tyrell in Fat City, was eye opening brilliant, and in my view, she not only deserved the nomination, but she should have won the award. It’s hard to believe she is no longer with us, but as long as there are companies like Twilight Time to release films that she was a part of, there will always be fans. Stacy Keach I have always felt is one of those Actors that truly can own, breathe, and live the part of the character. Keach throughout his vast career has always left a remarkable reality to his persona in film. All actors have hits and misses, but Keach no matter how out there, or odd the part was, he was always able express an emotional power in his characters, and Tully is no different. Still acting strong today, and is one of those actors that I seek out all performances. Well over 200 performances to his career, and there seems to be no end in sight; that’s wonderful. From the 60’s to the present, from TV to feature film, he is a true iconic legend in cinema. Fat City is one of his prime achievements. This is based on the 1969 book by the same name written by Leonard Gardner. Now the book is considered an American classic by many, as is the film version. Gardner also wrote for the TV series NYPD Blue. He also had a part in Francis Ford Coppola’s 1988 film Tucker: The Man and His Dream. Fat City clearly was Gardner’s achievement, and also one of Houston’s achievements. It is a film that sticks with you through the flawless performances, and the tight direction. The story is very bleak, blunt, and works in an emotional ordeal for the viewer. One thing that has to be mentioned is the cinematography by Conrad L. Hall. What an experience seeing. Conrad truly had an eye for what he wanted to capture, and display on screen. Conrad had an amazing career of films under his belt. Cool Hand Luke, In Cold Blood, Butch Cassidy and the Sundance Kid, Marathon Man, American Beauty, Road to Perdition, and many others he graced with his mastery. 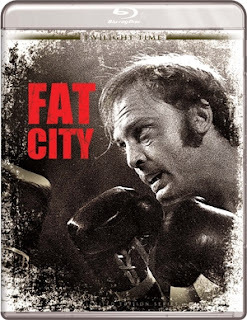 Fat City is film of excellence. Twilight Time gave another wonderful transfer and audio to an important piece of cinema. First time seeing this. In that regard this movie looks absolutely amazing for it's age. The audio is equally impressive. The sounds are crisp and the imagery is vibrant and looks like a perfect transfer to an older film. The imagery which was flawlessly captured by the cinematography comes to a life in this new beautiful transfer. Moments of the boxing rooms or ring come to life in all is rough nature. The out doors in imagery, from the sky to the ground come off in vibrant, or dust covered clarity. Truly a gifted experience in this new High Definition reality. Isolated Score Track. Twilight Time honored a great music legend that has often been overlooked, or simply forgot about. Marvin Hamlisch was a true gifted musician that should be remembered. The music department in this film had two persons working on the final beauty of the music for the film. Music editor was Kenneth Hall, and music supervisor was Marvin Hamlisch. Marvin had been composing music since the late 1960’s, and continued to do music for films all the way up to 2009. His music is still used today on many soundtracks to films. He sadly passed away in 2012 at 68 years of age. He left a vast array of music excellence in film. Working on films both great and small. The phenomenal and much underrated film, 1968’s The Swimmer. Woody Allen’s 1970's comedy Bananas. The wonderful romantic drama, 1973’s The Way We Were. The amazing, 1982’s Sophie’s Choice. One of my personal favorite childhood films, 1985’s D.A.R.Y.L. and many others. His talent was amazing, and his music is something to remember, talk about, and share. In the Music editing, Kenneth Hall has worked on film both small and large since 1959, racking up an impress career of well over 150 projects from TV to film. He worked on so many films that it would take too long to write up, so I will just mention a few, to showcase his reality in the film world. I think where he stands out the most, is his work on countless Cult following films, Horror films, and even guilty pleasure B-Movies of a Drive-In nature. From horror and Sci-fi classic’s like, Poltergeist (1982), 1989’s Leviathan, 1990’s Total Recall, to suspense and action films like, 1992’s Basic Instinct, 1993’s The Vanishing, 1997’s L.A. Confidential, to Drive-In wonders like 1976’s King Kong, 1977’s Day of the Animals, 1979’s The Amityville Horror, 1980’s Night Games, 1984’s Runaway, 1985’s Baby: Secret of the Lost Legend, 1985’s Explorers. He even worked on lower B-movies like 1978’s The Manitou all the way to comedy gems like 1987’s Innerspace, 1989’s The Burbs. He had a hand in so many styles of cinema. He worked his music editing charm on a vast career of cinema. Also in the music department, I think one has to mention the song, sung by Kris Kristofferson “Help Me Make It Through the Night which is displayed at the start of the film and the end. It adds a realm of sadness in its tone, just displaying perfectly with the underlining reality to the film. Audio Commentary with Film Historians Lem Dobbs and Nick Redman. A great listen as always. I love hearing thought provoking film historians talk about film. Redman and Dobbs know there stuff, and that’s the beauty of listening to commentaries on these Blu-ray releases by Twilight Time. Insert booklet my Julie Kirgo. Priceless as always. Another awesome, fantastic release by the wonderful company that honors, cares for, and respects cinema as important art, that should be expressed in top notch products. Twilight Time Blu-ray, always seem to amaze me in their products. Fat City is an excellent film. A great film to experience wonderful directing, acting, story.